Blending the scorpion with hard candy and a lollipop stick this edible delight will make your taste buds explode. 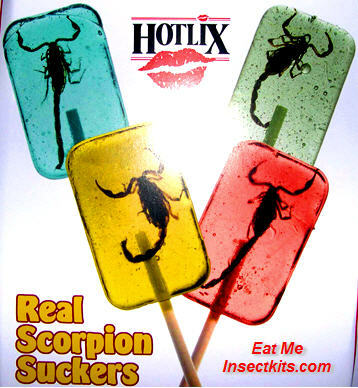 The Hotlix Scorpion is a yummy treat for those that dare something on the unique side. Each sucker comes in a variety of flavors or colors. Don't worry the scorpion will not sting you but this arachnid looks kind of scary encased in the candy. The Scorpion lollipop comes individually wrapped and makes a awesome gift for anyone who loves bugs, reptiles or arachnids. Only 25 known scorpions actually have venom. Quit acting like a baby now!! Ok really even though only 25 of these arachnids(yep just like spiders) are venomous the neurotoxin packs a punch if you happen to get stung by a scorpions tail. Qucik take cover! Here is my favorite fact about scorpions. They may even glow in the dark under UV rays. How cool is that? Mama carries her babies on her back. These little guys unlike most arachnids are born one by one. They creatures number 1400 varieties of this insect and some even can live in trees.